Hey everyone! I’m Steve! I’ll introduce myself better in future blogs, or you can hop on over to my profile to find out more about me! For this blog, all you need to know is that I am a biomedical engineer with an emphasis in electrical engineering. If you’ve been reading other blog posts this week, you’ll notice that Leah Gum wrote about Electrical Engineering 201 as her favorite (and hardest) class. As she mentioned, I am her lab partner, and I would have to agree 100% that it is simultaneously my hardest and favorite class. She did a great job of explaining it though, so I won’t add much except to say that basically EE201 (and EE101, it’s precursor class) were/have been awesome. Every single time I leave that classroom I know so much more about computers than I did going in, whether it’s the foundations of digital logic or coding in verilog. Anyway! I am now going to write about my 2nd favorite and 2nd hardest classes! Let’s start off with the fun side: 2nd hardest! I’m gonna give this honor to Math 445: Mathematics of Physics and Engineering. This class is hard for me because personally, I have never been in love with straight math. I am fine with applying math in engineering classes, but sometimes when it’s just learning formulas and trying to grasp unintuitive concepts, it can be struggsville for Steve. 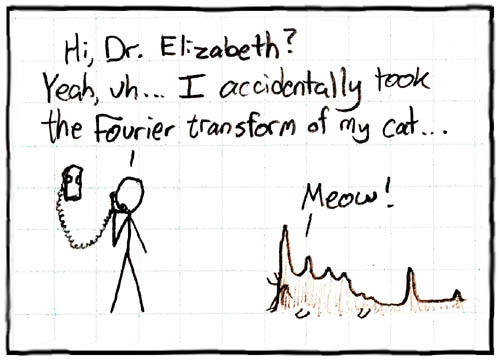 That being said, the math (Fourier Transforms) is incredibly relevant to BME and EE, and I’ve already taken some similar classes, so I think I’ll make it through. My Teaching Assistant is super helpful and patient, and so is the professor. Now on to the actual fun stuff: 2nd favorite! This award goes to Biomedical Engineering 425: Basics of Biomedical Imaging. This class is basically a crash course in everything from X-Rays to CT to PET to MRI and all it’s various subcategories. Medical imaging is a huge part of biomedical engineering, and our professor, Dr. Singh, has done a lot of work research in the field so he does a great job of explaining the pros and cons of each imaging modality, as well as where he sees them going in the future. We get down to the nuts and bolts of how these things work, and MRI in particular is crazy genius. Unfortunately, it would take me another 10 pages of blog to tell you about it, and then I’d basically have written my term paper… so maybe… no, you’ll just have to wait, haha. Anyway, how can any class where the professor invites you to come to his lab and look at your brain not be a favorite class?! I could have a picture of my brain, just like these!